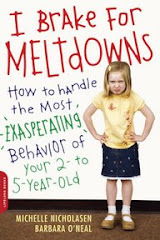 I Brake For Meltdowns: How Did I Get Here..? I never imagined it would really happen, getting on the slopes. I thought I kissed goodbye my 20-something hobbies a long time ago. With five little ones, what a joke to think I’d ever ski again before my silver years. But it happened this season, and I’m a little shocked by it. Now I’m trying to understand what it all means and what role skiing will have in our lives. Why did we do this? I know the answer and I’m not sure it reflects well on us. I am always trying to delude myself that we’re a normal family. (We’re not, of course, because we’re saddled with all the logistical obstacles related to moving around 5 kids.) So when friends at school invited us up to New Hampshire to go skiing, my husband and I said yes, of course we will. Then I spent an insomniac’s night at our friend’s house wondering how two adults are supposed to accommodate the 4 different skiing levels we theoretically have in our family. Can I ski with one between my legs while instructing another? Will we ever convince anyone to take the tow-bar by herself? How long will Bevin, our petite, tolerate those storm-trooper boots? Would a meltdown on the slopes be just the ultimate? If we can get our entire family on skis, then anyone can. This is what happened. A few disclaimers: We purchased used ski equipment at a high school sale in October. (Presumptuous, don't you think?) 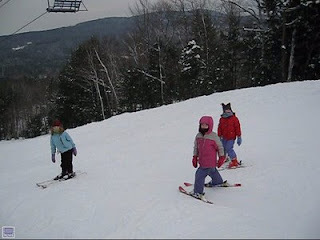 We go to ski resorts in N.H. where kids 5 and under ski for free. A few of our children had tried skiing last year. Our 8yo and one of her triplet sisters are solid beginners. Finally, my husband and I can ski, but haven't done it together in 12 years. A disaster. It takes 3 hours to get equipped while all the kids moan, complain and refuse--one plants herself in the lodge with our friends. Then four kids attempt the slopes for 20 minutes in a blizzard. Wind and snow lash our faces, and we don't have ski goggles. My back hurts from holding the kids between my legs and yanking them up when they fall. We waste a lot of money. I vow I'm not coming back for five years. One of our 5-yos (who gets cold easily) stays at home with her grandparents. We put our 4yo in a half-day "ski club" while I ski with our athletic 8yo and 5yo on the easy intermediate trails. (First moment of zen occurs when I realize I am successfully riding on a ski lift with 2 of my daughters.) Jim takes our last 5yo, who always needs a lot of one-on-one attention and painstakingly goes through every step on the bunny hill. By the afternoon, my two are feeling really comfortable on the easy intermediate trails. And Jim reports Lucy is doing fine on the bunny hill. We pick up Cian from ski club and he shows us his "pizza" "french fries" and "magic hands," and I am in awe. The ski instructors are much better teachers than we are. This time we have all 5 kids, and I'm a little anxious. We convince Bevin, who stayed home last time, to join her 4yo brother in 1/2 day ski club. How? We tell her she will get hot chocolate and a video there, which is true. Now we have two parents with three kids for the next 3 hours. Jim goes back to the bunny hill with Lucy, since she refuses ski club and responds well to her dad's patient manner. I ski with my same 2 girls, who are now doing their turns very comfortably. It's a whole morning of Zen! I cannot believe how much fun I am having enjoying the scenery of the White Mountains, and watching the girls learn so much. Just before ski club pick-up, Jim and Lucy show up. She is ready to try intermediate. She takes it slowly at first, then really gets into it. I go to ski club. They've done it again--taught another one of ours to ski. I take Bevin and Cian to the bunny hill for the rest of the afternoon, which gets cut a little short because they are pooped. Oh man, we have got the logistics down to a smooth operation. At Tenney Mountain we know exactly where to unload, place our skis, put on ski boots and even where to put our bag of food. We now have only two different levels of skiers--beginner and intermediate. Jim and I go off with our respective group, then switch in the afternoon. This is the best ski day so far. We go back to Aunt Martha and Uncle Don's house with big appetites and tired bones.